It’s not often I get to spend time with royalty, but that’s exactly what I got to do over the weekend. Meet the 2010 Portland Rose Festival princesses, surrounding my friend Lea McWhorter, of Sophisticated Beads, who created beautiful jewelry for the lucky young ladies. It’s very rare for me to be around younger people – all my children have been furry! As I chatted with the princesses I was amazed at how articulate and focused they were. They wanted to work in public relations and medicine, music and business. They were crystal clear about where the next leg of their journey would take them. After speaking with these fabulous young women I suddenly found myself choking back a few unexpected tears. I was swimming in a sea of rosy cheeks and sparkling eyes. I tried to imagine myself at their age – was it really over 35 years ago? Was there ever a “once upon a time” when I could so easily reach out and touch my hopes and dreams, as these young ladies could? 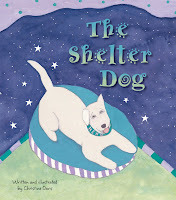 Then I remembered Hero, the canine star of my book The Shelter Dog. Hero was EXACTLY like these young women – hopeful and happy, sure of his mission and blessed with a loving heart. I wrote Hero…and for the first time I realized that Hero was ME! I remembered my book Old Dog & the Christmas Wish, and thought about the weary, four-legged boy who longed for a Christmas miracle even though his situation was desperate. I wrote that dog…and he was me, too! Yes, my cheeks get some of their rosiness from a jar, and the sparkle in my eyes is probably allergy-related, but I am certain that a child-like innocence still resides somewhere inside me. And every so often…if I’m really, really lucky…it spills out onto the pages of my books. Here’s to our inner children! Chris, this brought a tear to MY eye! Isn’t it nice to know our “children” never have to grow up? 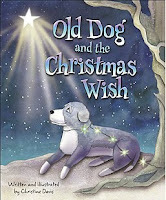 And that when our “inner child” manages to surface, our furry children are ready and waiting? You’re so right, Bernadette – our furry kids are always ready to play with our inner children. Sounds like a match made in heaven!